The battle for the $600 billion global advertising market still rages, but the war is already over—digital has won. Over the next three years US digital advertising, driven by mobile, social, and video, is expected to surpass TV in revenue. At the same time, ad buying will become increasingly automated thanks to online programmatic exchanges. This transformation will shift power and profits to digital platforms at the expense of traditional media. TV is losing viewers at an alarming rate. 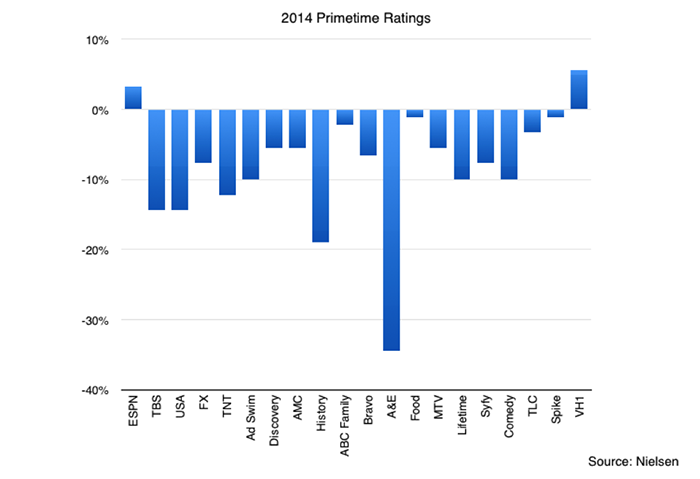 Ratings for primetime broadcast TV have dropped by half since 2002. In 2014, cable ratings fell for 18 out of 20 top cable channels (chart below). Even ESPN—the most resilient and highly rated cable network—is coping with a shrinking audience; the network has lost 7.2% of its subscribers since 2011. 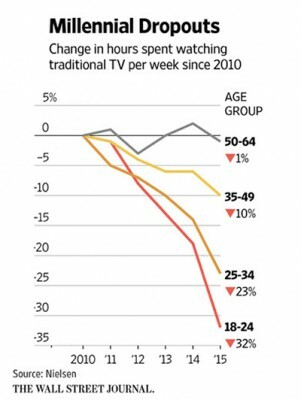 Young people in particular are watching less TV. According to Nielsen (chart below), Americans aged 18-24 watch 32% less TV than they did five years ago. While TV consumption is down across all age groups, this is clearly a generational trend—kids today have YouTubeGOOG, NetflixNFLX, and InstagramFB at their fingertips. TV is one option among many, not the default option as it was a generation ago. The big winners of this transition are Internet advertising companies and online video companies like Netflix and Hulu. 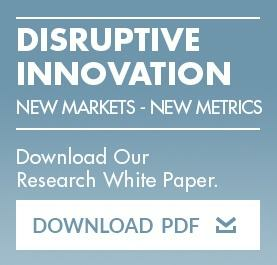 According to eMarketer, US advertisers will spend more on digital ads than TV ads by 2018. Four areas in particular will drive growth in digital advertising: mobile, social media, video, and programmatic ad buys. 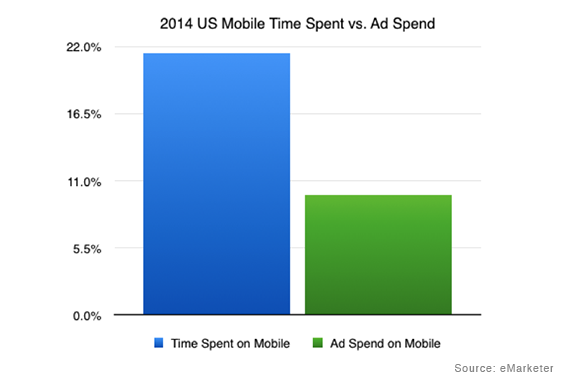 People now spend more time on mobile than on PCs, and ad dollars have followed suit. In 2014, worldwide mobile ad revenues more than doubled year over year to $40 billion, making it the fastest growing category. In 2015 it’s expected to grow a further 60%. The mobile advertising market already is emerging as a two horse race, with Google and Facebook expected to capture half of the mobile advertising market this year. 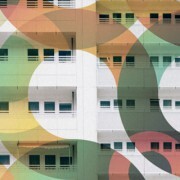 With Android, search, and YouTube, Google occupies a fortified strategic position, but Facebook is gaining ground. The latter grew 75% year over year in Q2 2015 thanks to its highly engaged user base and powerful tracking and attribution platform, Atlas. Facebook’s portfolio of mobile apps, Instagram, Messenger, and WhatsApp are largely unmonetized and offer great long term potential. Mobile ads have a long way to go. People today spend 22% of their media consumption time on mobile (chart below) while advertisers only spend 10% of their budget there. As mobile advertising grows to a forecasted $40 billion in the US and $100 billion globally in 2016, this gap should begin to narrow. If the mobile advertising market is a two horse race, social media is a one horse race with Facebook the clear leader. Facebook is expected to capture almost 66% of the global social media ad market in 2015, up from 65% last year. TwitterTWTR and LinkedInLKDN are expected to capture approximately 9% and 4%, respectively. By 2017 the market is expected to grow to almost $36 billion from approximately $24 billion in 2015. While various social networks have come and gone, Facebook is unlikely to be dislodged any time soon. With over 1.5 billion monthly users, Facebook’s core app remains the largest and most used social network in the world. Facebook continues to evolve this product, with recent additions including Instant Articles and auto-play videos. Its users are highly engaged, with close to a billion checking in on any given day. Moreover, Facebook’s portfolio of social apps, Instagram, WhatsApp, and Messenger, all have hundreds of millions of users and serve as a hedge against fickle tastes. Digital video ads closely resemble TV commercials, making them well suited to take share from TV. 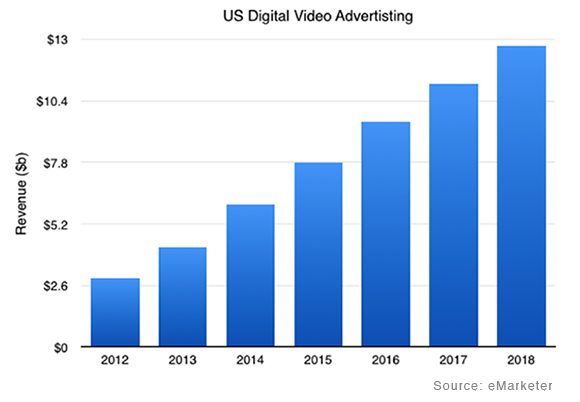 While digital video advertising spending is expected to grow 30% in 2015 to approximately $7.8 billion (chart below), it’s still a fraction compared to the almost $71 billion expected for TV. While expectations for digital video ad spending remain conservative—eMarketer expects digital video ad spending to grow to $12.7 billion or 16% of TV by 2018. Higher penetration would not be surprising. YouTube, Facebook, and a host of smaller social apps are all making a play for the digital video advertising market. Google’s YouTube is by far the world’s largest video platform with over one billion users. Despite its size, YouTube continues to grow briskly—viewing time is up 60% year-over-year as of Q2 2015 and YouTube now has more 18-49 year old viewers in the US than any cable network. Contrast this with the average 8% decline in TV ratings across the top 20 cable networks in the adults 18-49 year category, and it becomes clear how quickly attention is shifting online. Facebook’s video ad products, though still early in their development cycle, have tremendous potential for advertisers. Facebook has a larger audience than YouTube at 1.5 billion monthly active users, which is due in part to an important distinction between the two products: Facebook can push video to users whereas users must go to YouTube to consume video. With 4 billion views daily and growing fast, Facebook’s video reach is truly unprecedented, and advertisers are just beginning to understand the power of the platform. Twitter and Snapchat have also launched video ad products. Among these, Snapchat’s offering is particularly compelling: its ads play in the vertical orientation, making the experience optimal for mobile. Snapchat is charging $20 per thousand views for ads in its Discover section, a rate comparable to TV shows. Programmatic advertising erodes one of the primary advantages of TV advertising—its ability to reach a large number of people through a single channel. Programmatic advertising is automated ad buying, at scale, based on consumer data. Instead of buying ads on a variety of specified websites, video portals, and social networks, programmatic platforms let the advertiser set a price and audience criteria then automatically deploy an ad across all matching slots on the Internet. The simplicity and scale of programmatic advertising are driving rapid adoption. American Express has stated that it would like to switch completely to programmatic ad buys in the future. 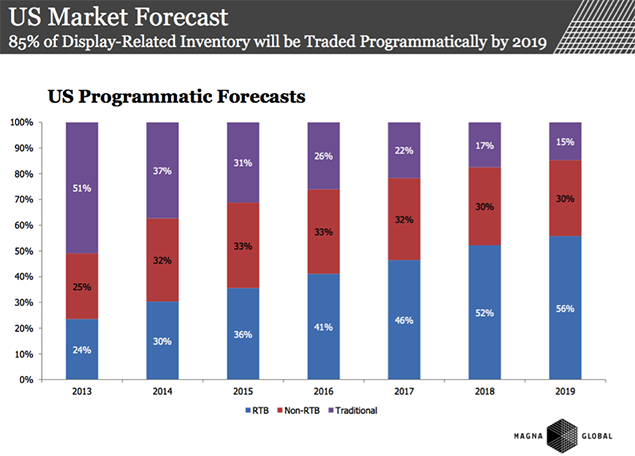 According to Magna Global (chart below), programmatic advertising is expected to grow from 62% to 86% of all display ad purchases by 2019. Currently display ads make up about 45% of all Internet advertising. Above: RTB: Real-Time Bidding, ad buys where prices are determined via auction. 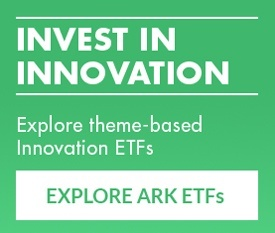 Non-RTB ads typically have a reserve price. Programmatic ad buys don’t stop with digital. The strategy has also made inroads into the traditional world and is expected to account for 4% of US TV ad budgets in 2015. As more ads are bought programmatically, the key digital ad platforms—Google DoubleClick, PubMatic, Rubicon and Facebook’s emerging Atlas platform—are well placed to capture ad buys across both online and offline content. In addition, pricing discrepancies among disparate media types should resolve more quickly as programmatic ad buying takes place across more media platforms.. Ad spending on nascent media should become commensurate with their popularity. As viewers move from offline to online, power is shifting from old media to new. Though TV viewership is broad based, its numbers are falling off, and it is only a matter of time before TV ad spend follows in a similar downward trajectory. While the old guard fumbles, the digital juggernauts will continue to innovate at a rapid pace and should capture incremental TV advertising dollars. 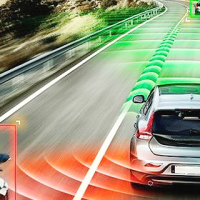 In the long run, programmatic ad buying platforms are well positioned to capture not only the bulk of the digital advertising market, but perhaps the traditional advertising market as well. 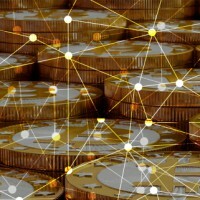 Micro-Sharing Economy: Driving "Good Deflation"
Peer-to-Peer Lending: Better for Borrowers. 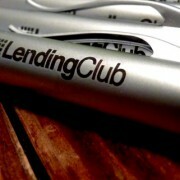 Better for Lenders. Terrible for JP Morgan Chase?